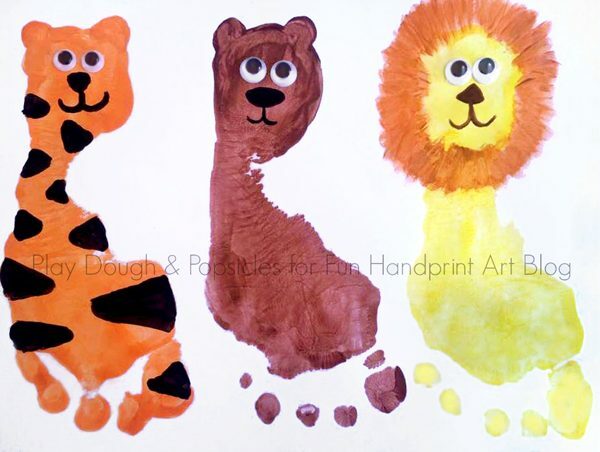 The Wizard of Oz Footprint Puppets | Lions, Tigers, & Bears… Oh My! Do you have the classic Wizard of Oz song stuck in your head now? I know I do! But it’s okay, we love the *The Wizard of Oz . It’s one of the movies that I am okay with my daughter having a random obsession with. You know what I’m talking about? Kids. They watch a movie and then want to watch it 100 times in the span of 3 days. 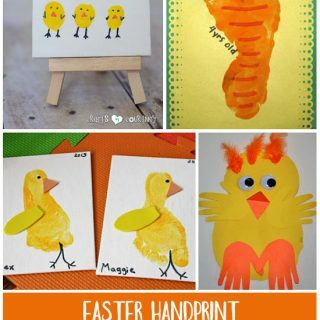 To go along with her love of the movie, we made the cutest Wizard of Oz footprint puppets! *This post contains affiliate links. Please see our full disclosure policy here. After watching this movie, my daughter wanted to do a craft. I suggested a Dorothy and Toto, but she wanted to do a Lion, a Tiger, and a Bear. When she comes up with ideas all on her own, we run with it! We were so excited to make these puppets that we also made a lion, tiger, and bear from paper plates. We decided that footprints would be the easiest way to create the head and body, then we could add the other parts with a paint brush. 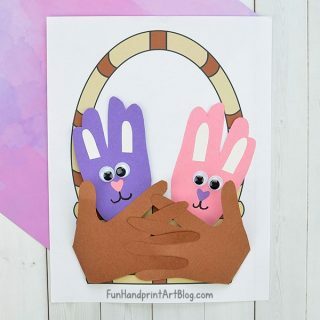 We had so much fun creating these animals and in the end decided to turn them into hand puppets. 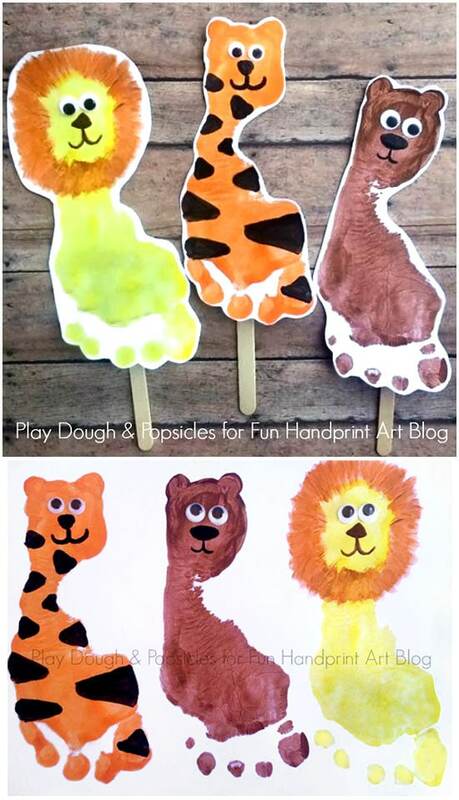 We like doing animals on paper like this footprint teddybear or this handprint tiger, but making these into puppets was different and fun! We started off by laying out one sheet of white cardstock. I painted her foot in yellow, pressed it on the paper to create the lion. After wiping the yellow paint off her foot, we repeated the process with brown and orange paint. We let the paint dry for just a few minutes and then painted on the faces, tiger stripes, tiger and bear ears, and the lion mane. When the paint was completely dry, we glued on the googly eyes to each animal. 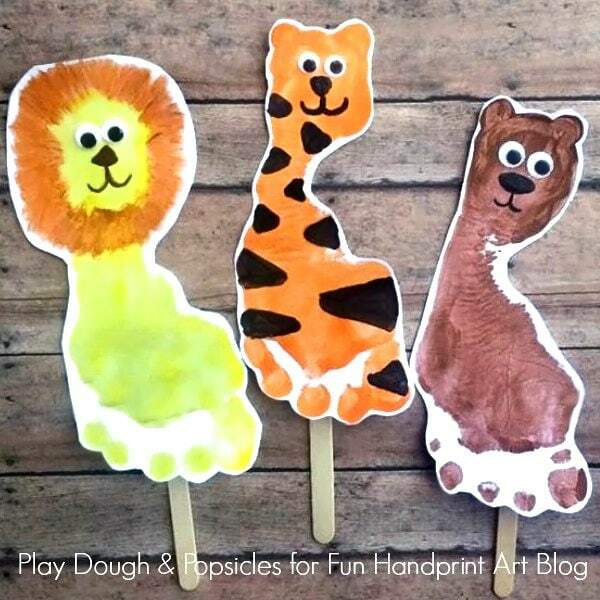 I cut the animals out and we glued them onto popsicle sticks. My daughter sat on the floor next to me and I painted her foot. 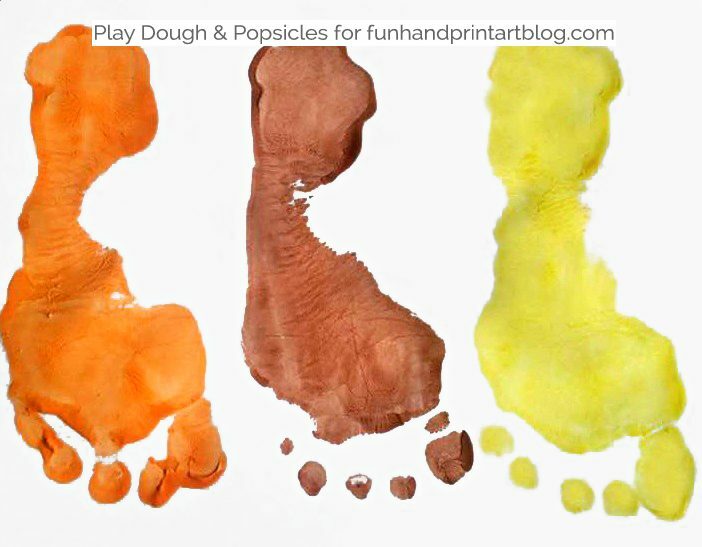 Too much paint will make it easier for her foot to slide around on the paper, but not enough will not create the footprint look on the paper. I held it with a pretty firm grip so she couldn’t move her foot, even by accident. I pressed her foot firmly onto the cardstock, pushing my hand down on the top of her foot. When it was time to take her foot off, I used the same motion as applying the foot to the paper. One hand on the base of her ankle and one on the top of her foot. Pull straight up. If necessary, press down on the paper to help pull it away from the foot.